Belt length 105CM (41.3inch) suit for waist size 25"-29". Belt length 110CM (43.3inch) suit for wait size 28"-34". Belt length 120CM (47.3inch) suit for wait size 35"-39". Belt length 130CM (51.18inch) suit for waist size 40"-44". Fit size - Four sizes to be chosen: 40.5"belt suits for pants size 25"-29", 43.3"belt suits for pants size 28"-34". 47.3" belt suit for pant size 35"-39'.51.18" belt suits for pants size 40"-44".Strap width 1.3". If you are not sure about your size, take the big size one and trim it. 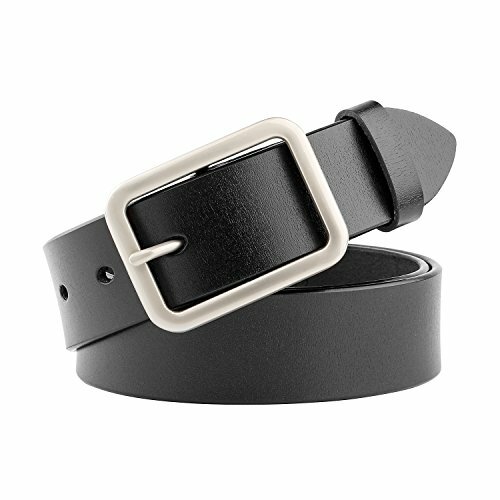 Belt Material - This belt is made of high quality leather with special craft to get the great smooth and soft touch feel. Shiny and solid buckle is made of zinc alloy, no scratch no fall apart. High-class materials make sure the great wearing experience, you deserve it. Gift Box - This women belt is enclosed in a luxury gift box.A fantastic gift for women,mom,lover,daughter and female friends on Thanksgiving Day and Christmas with Gift Box. Seller promise - 45 days free exchange and return, 360 days warranty. In any case, leave us message to get the most satisfactory solution.